Axe Handle Steel Wire Wrap Protection. I use a Garant 6lb splitting axe on a regular basis (splitting about 4-6 cords of maple, ash, silver birch and some spruce each year) and even if you are careful, it is very hard to avoid wacking the handle on a piece of wood that just won't split straight. Garant provides solid handles made of ash, but they only last so long. Having recently replaced a handle on this axe with a new 36" rock maple handle I made myself, I thought why not ensure it lasts a bit longer? But in my case I decided, why not give it a try with something more tougher, so I went with 3/16th inch steel wire. I followed the same procedure, though I did keep the steel wire wound pretty tight, but seeing I put the axe head in a bench vice and used a Vise-grip pliers to pull the wire end under the wrap at the end of the procedure, everything went ok, though I DID have to yank pretty hard... If you're out in the woods, perhaps sticking with paracord might be a good idea, but if you do have access to Vise-grip pliers and a solidly attached bench vice, then go for the steel wire. To estimate what length of wire to buy I did use some string to simulate my wrap, and measured that before going to the hardware store. Just to avoid the wire end from fraying and ending up with my hands getting poked with sharp strands of steel wire, before beginning the wrap, I ensured one end of the wire was VERY cleanly cut (hardware stores aren't always very careful about this) and put soldering on it to ensure it did not fray. So I used the unsoldered end first (for the loop), and had the soldered end drawn through under the wrap at the very end of the procedure. 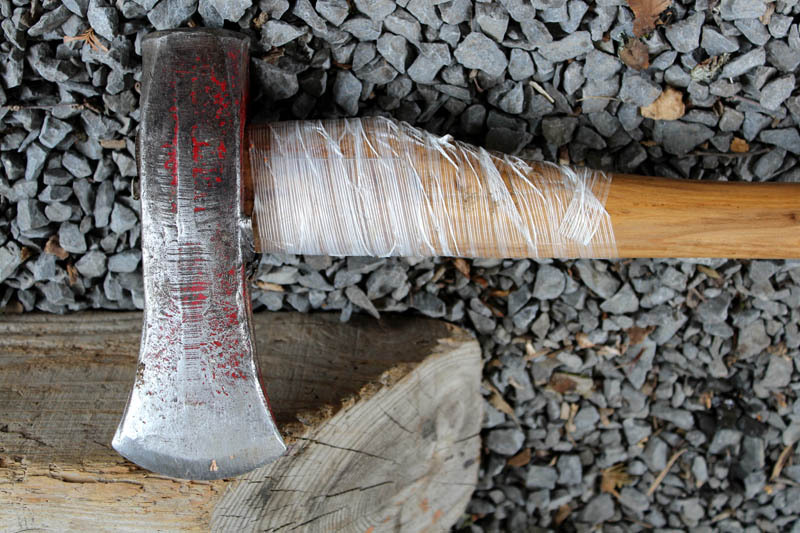 Like in the video, I began the wrap nearest to the axe head. Just before laying down the very last strand of wire (and then drawing it under) I did use a small round file to file in a small bump in the wood at the top of the handle (farthest away from the axe edge) to ensure the wire did not wander down the handle but stayed put. In the photo below, that's to the right, just under the last strand of steel wire. Well unfortunately my world-changing experiment failed. Yesterday as I was splitting more wood, the whole wire wrap unravelled and came off. Yes, this is the pop-bottle axe handle protector. "So where's the pop-bottle?" you ask. Well, under the fiberglass tape you see, there is piece of transparent plastic I cut out of a 1l Pepsi bottle. Pop bottles are pretty strong. Heck, stick a 2l Pepsi bottle full of water in a freezer til it's hard as rock and it still won't bust, though most other plastics in the same circumstances would be ripped apart.